This presentation helps to teach students to identify the main idea and details in a text, as well as summarize what they've read using the GIST strategy. Includes definitions and examples. Originally developed for use in my ESL Language Arts classroom, this powerpoint can assist any student in mastering main idea and learning to summarize. 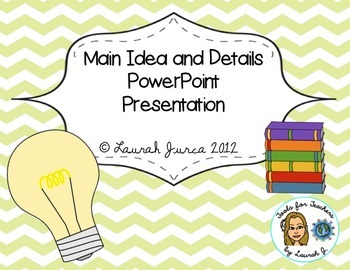 This presentation pairs perfectly with my other main idea products, and is included in my Main Idea and Details Teaching Pack. This presentation is presented in PDF format and can be projected just like a powerpoint presentation. Simply choose "view>full screen mode". Please ensure your Adobe Acrobat and Flash player are up-to-date. This presentation is not editable.